Yep, I’m keen to go in again too. Thanks for stepping up again Colonel. I’ll have to this year. Missed the boat last time, but looked fun. and @efc1robbo trauma your own ■■■■ players don’t follow mine. so your saying i should trauma Mckenna? Where’s the odds? Where’s the odds??? I think we need a weekly “Where’s the Odds” thread. There will be rates and bonus payments for R1 game posted this evening. I would like to see an injury report from the Club, but if it does not drop I will post rates anyway. 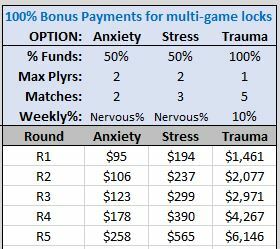 I will post bonus payments for at least first 5 rounds - so anyone taking a trauma lock will know what else is available during their lock period. I will also document the rules and post them. Injury report released two minutes ago and still no odds. Panic me up Ridley!!! (To be confirmed once odds are released). This is the simplest option. You have $100 to start, you invest it in a player or split it over a couple of players. If they play you get a return of $100 x the nervous rate. So if Ridley plays you will get a return of $100 x 40% = $40, so you will now have $140. If your players do not play, you lose some of your $100 for each player who does not play. Round 1 - Bonus payments for locks over multiple rounds. 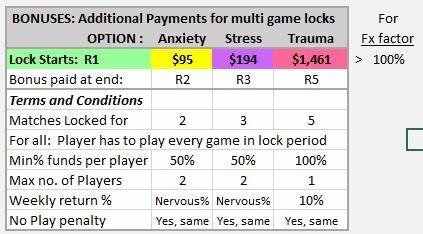 However there is also a bonus reduction factor that applies depending on the average weekly nervous rate of the player over the lock period - as shown in this table. So if @barnz wants to Trauma McKenna for the first 5 rounds. 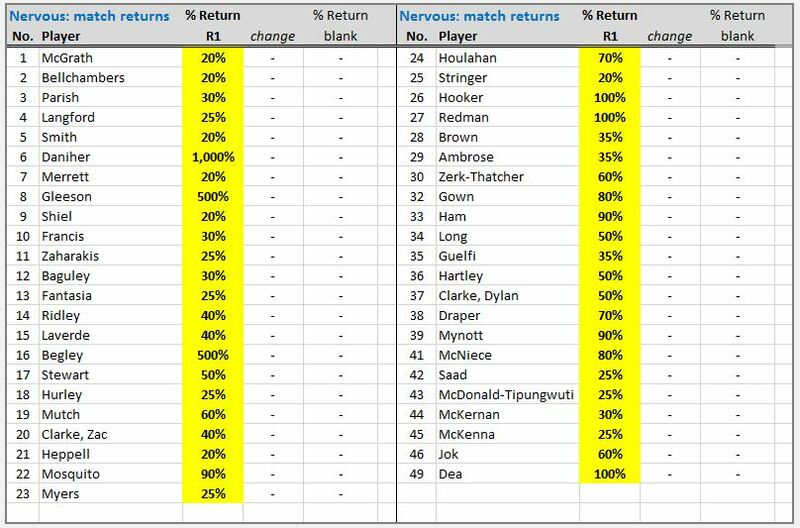 He will get a 10% return for each of the rounds McKenna plays, and a bonus payment on top of that if McKenna plays all the first 5 rounds. If McKenna’s average weekly nervous rate is 25%, then the bonus Trauma payment after R5 will be $1,461 x 90% = $1,315. From Round 1 we will also be starting the Best Players bonuses (if your player(s) get named in the best players, and Win Jackpot - for games EFC wins. There are more details for how these work in the First Post (press home to see the OP). Welcome new Gamer. However, there is a line in one of the tables that says the max no of players that you can take out locks on. For Trauma it is only 1 player, For Stress and Anxiety it is 2 players.